getting face to face with Africa's wildlife on foot. Walking safaris in South Africa are an incredibly thrilling experience. Here you are on foot in the midst of the African bushveld and its wildlife. Close up encounters with elephants, rhino's, buffalos, zebras giraffes, lions and a variety of other predators and antelope species awaiting you behind every bush and around every bend. Your senses become immersed in the sights, sounds and smells of the bushveld around you. Talking about walking safaris, it might be interesting to note that the word safari comes from the Swahili language spoken by the people around the African great lakes. It is of Arab origin, meaning "journey on foot" and that is what safaris In Africa's historical times were all about. Explorers and discoverers, slave traders and tribes on the war path, large bodies of people plodding through the African wilderness for months on end, covering vast distances. Safaris on foot are for the more adventurous who want to get as close to nature as possible. 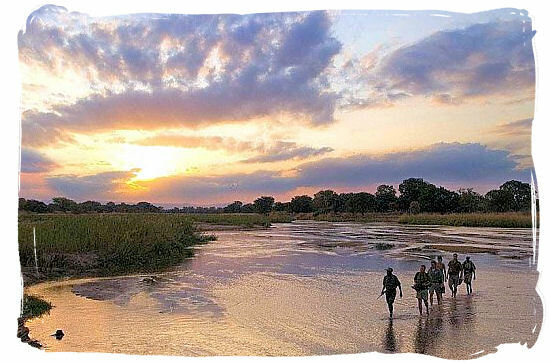 Many game reserves and also national parks such as the Kruger National Park in South Africa offer bush walks under the guidance of armed rangers, often in between game drives. They last for up to 4 hours. Bushveld hiking is one of the best ways to explore Africa's wonderful wildlife and scenery. The highly trained rangers will use all their skills to ensure that no unnecessary risks are taken. Some of the private game reserves and national parks including the Kruger National Park, offer walking safaris on a larger scale. Armed rangers and trackers accompany groups of usually no more than eight on an exploration of the African bush lasting on average from 3 to 6 days. At night you will sleep in a basic bush accommodation in the form of a tent or a simple hut. Walking safaris in South Africa are an extraordinary and exciting alternative to guided game drive, self-drive and fly-in safaris. Just imagine yourself walking in the African wilderness in the middle of nowhere, miles from any signs of civilization, getting face to face on foot with black and white rhino, elephants, giraffes, zebras and a variety of predators and numerous antelopes. Between experiencing Africa's wildlife and scenery on foot or from a noisy safari vehicle lies a world of difference. Indeed, on a walking safari you will cover a lot less territory, but then, the feeling of becoming one with the bush around you is so extraordinary and so different. The beating of your heart, the sharpening of your senses, the alertness to every sound as you edge closer to a Rhino, Elephant or even a Lion is an experience that will stay with you forever. 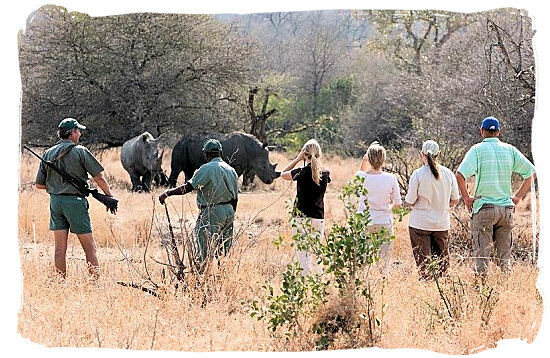 Find the walking safari in South Africa that suits your interests and preferences. Compare: over 450 safari tours, over 500 specialized safari tour operators, over 50 national parks and game reserves and more than 200 user reviews. Called classic because this type of walking safari is a close representation of the original safaris of the early days. Under the guidance of well experienced rangers their duration can be anything from 3 days upwards. There are no prepared campsites and no toilet facilities. Participants have to be completely self-sufficient, backpacking their own tent, food, water and clothes, setting up camp at a different location in the raw bushveld each night. You can't get much closer to the immense beauty of the African wilds than this and moving from place to place, sleeping in different settings it feels like a "journey", a true safari. These are comparable to the Classic Walking Safaris. The main difference is that the mobile type of walking safari is of a more comfortable nature. 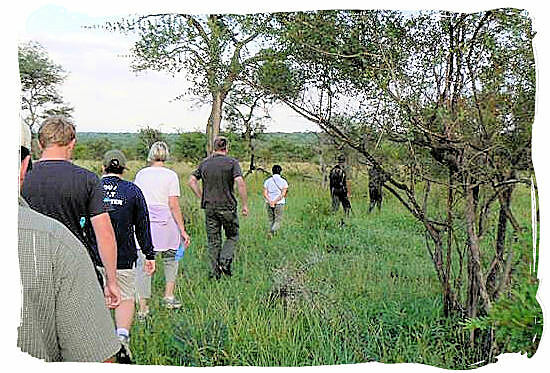 Participants walk form camp to camp under the guidance of experienced game rangers, backed up by a support team. The camps can be in the form of temporary tented camps which are broken down and set up by the support team each morning and night, but they can also be more permanent camps at different locations. Amenities include sleeping, toilet and shower facilities. Meals and beverages (non-alcoholic) are also provided. These are relatively short 2 to 3 hour game walks conducted mostly in the early mornings and late afternoons under the guidance of experienced game rangers. These game walks are offered by most safari lodges and National Park rest camps as an activity next to their regular game drives. They are usually held in the nearby area surrounding the camp or lodge, offering a great and affordable opportunity to give the idea of a walking safari a try and to see how it compares to a game drive. 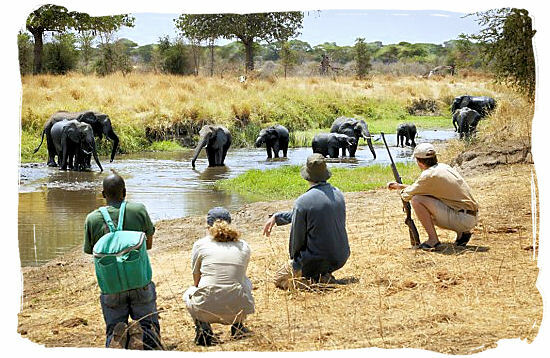 This type of walking safari is conducted from a permanent base camp or lodge. Participants stay at the camp for a period of 2 or more days. Experienced rangers will take them on 3 - 4 hour game walks into the bush each morning and afternoon. They will return to the same camp or lodge each time and at the end of the day they can enjoy a proper bed with shower and toilet facilities. Simple but wholesome meals are usually provided together with water tea and coffee. Anything else you might have to bring yourself depending on arrangements and circumstances. Group of safari participants on a mobile walking safari, a reminiscence of the safaris of the early days when travelers into the African interior had to plod through its wilderness day after day for months on end to reach their destinations. There was no other way. Today we do all this for reasons of pleasure and tourism like exploring Africa's nature, wildlife, beautiful scenery, different cultures etc. On a walking safari you are doing all this on your feet at grass roots level like the group of people in this picture who are crossing a river bed through shallow water. Meeting the giants of the African savanna on foot, is a breathtaking experience. The first question that may come to your mind is, how dangerous is this and how safe is a walking a safari. If you take the necessary precautions and have somebody who has intimate knowledge of the behavior of animals in the wild as your guide, this type of safari can be quite safe. A lot depends on the knowledge, skills and experience of your guide who should be armed in case of an emergency. In general the animals will avoid contact with humans and will in most cases just disappear. Keep your distance and avoid anything that could make them feel cornered or threatened, because it is then that they will become aggressive. That also applies to the Elephants in this picture. Morning bush walk in the region around Boulders Bush Lodge in the Kruger National Park, South Africa. The number of people on a bush walk is usually limited to around eight participants and two armed rangers. The rangers are highly skilled and experienced with an intimate knowledge of the plant and wildlife you are exploring. If you obey the rules and follow their instructions, your walking safari will be as safe as a game drive in a vehicle. The animals in the bush will avoid contact with humans as much as possible. The skill and experience of your ranger guides will make the difference, ensuring that you will see a variety of wildlife including animals such as Elephants, Buffalo's and Lions without any mishaps happening. Eye to eye with a pair of White Rhino's, and on foot, a blood-tingling experience. Rhinos are well known for their poor eyesight, it is almost impossible for them to identify anything beyond a distance of 30 meters. Therefore their sense of sight is not of much use to them in their day-to-day life. They rely on their sense of hearing and especially their sense of smell. So if you encounter a Rhino and are more than 30 meters away from it, you can be quite safe provided that you are downwind, are not making any noise and remain motionless. Even more so when it is a white Rhino as shown in this picture. It is more even-tempered and less likely to charge than its more aggressive counterpart the Black Rhino. Short video about a walking safari in Mana Pools National Park in Zimbabwe, showing some breathtaking face to face elephant encounters. As one of Southern Africa's top game-viewing areas, Mana Pools is situated in northern Zimbabwe. The Park is home to 2,500 square kilometers of Zambezi River flood plain and river frontage that turns into a wide stretch of lakes and pools after each rain season, attracting large numbers of animals in search of water. The following video is also about a walking safari party running to into a big Elephant bull. But this time it becomes a real confrontation when the massive bull gets irritated and advances on them with a mock charge. The reason for the Bull advancing on us became later evident when we were told by the clients that one member of the group had tried to run down the river bank and another had moved position, we were not aware of this during the encounter as we where approx 4 - 5 meters in front of the clients and were concentrating on the Elephant actions, both clients where held still by other members of the group as per our pre trail briefing, this can be seen in the clip where the Elephant reacts to the persons moving across and in front of the camera. At this stage it is important for the guides to concentrate on the potential threat and deter a situation, which we did. The Elephant then backed up and moved off. We continued our walk after the excitement within the clients had returned to normal, I reiterated at this point to the clients on the importance of not moving or generating noise during such an encounter such as had occurred. The Elephant was not provoked or harmed in any way. Short video of Robin Pope safaris, a well known safari tour operator in Zambia. It shows a typical mobile walking safari where you move to a different location each day, including the setting up of the camp and the tents with beds and bathrooms, as well as the preparation of the meals. Video about a walking safari experience in the region around Tanda Tula Safari Camp. Tanda Tula is a luxury tented safari camp situated in the heart of the world renowned Timbavati Private Nature reserve, which in turn is situated adjoining the Kruger National Park in South Africa. This video is also about a walking safari experience, but this one is in the region around the Track and Trail River Camp in South Luangwa National Park in Zambia. With the Luangwa river as its life-blood attracting a large diversity of wildlife, the Park is well known for its walking safaris, where they in fact originated.